Malaysians have a traditional love for meeting people, making new friends and welcoming guests into their homes. In turn, for many Malaysians as well as visitors to Malaysia, there is little that is more interesting than staying as guests in a traditional Malaysian home. Malays, Chinese, Indians, and others create the social fabric of its society. 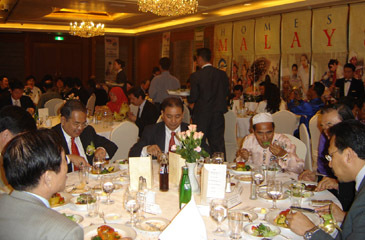 Although each ethnic group has its unique cultural identity, all share an outgoing and warm hospitality for which Malaysia is well known,"said counselor of the Embassy of Malaysia in Seoul Shaharuddin Othman in a luncheon speech held at the Sapphire Ballroom of Lotte Hotel in downtown Seoul on April 28, 2005. Haji Sahariman Hamdan, president of Homestay Association Malaysia, welcomed everyone for the event titled "Malaysia Homestay Seminar." 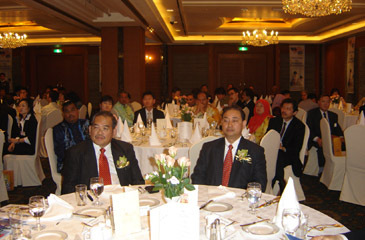 Director Abdul Mutalib Awang of the Malaysia Tourism Promotion Board (MTPB) adress the seminar audience at Lotte Hotel. "All villages involved in the Homestay program are carefully selected and comply with strict guidelines from the ministry of Tourism in order to bring out the best of Malaysia,"said Mr. Haji Hamdan. The Malaysian Homestay Program began in 1988 at Desa Murni (rural village), a community of five rural villages that includes Desa Murni Sanggang, Desa Murni Sonsang, Desa Murni Kerdau, Desa Murni Ketam and Desa Murni Perangap. The villages are 15 minutes drive from the town of Temerloh, and about 120 kilometers or 90 minutes drive from the capital city of Kuala Lumpur. In 1995, the then Malaysian Ministry of Culture, Arts and Tourism (MOCAT) and the State Economic Planning Unit (EPU), working in concert with community members and village elders from Desa Murni, gave the program a boost. The government provided certificates to host families, developed a brochure, and helped with promotion as well as replication of the program in other areas of Malaysia. 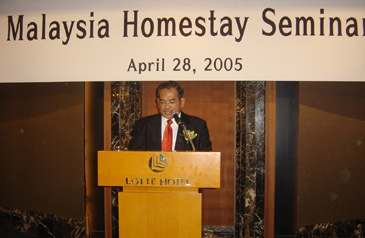 Over time, this led to the development of the Malaysian Homestay Association. 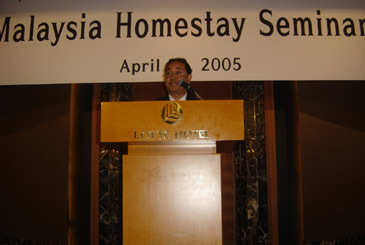 Mr. Jay Joo of the Malaysia Tourism Promotion Board (MTPB) officiates Malaysia Homestary Seminar. This program is a means for Malaysians as well as foreign visitors to experience the rural and traditional Malaysian way of life, and for the local Desa Murni community to participate in and benefit directly from tourism. There are 3,647 participants from 124 villages across the country are registered through Ministry of Tourism , Minister of rural Development, and Malaysia Homestay Association. Thus, availability of room is 4,423. All villages involved in the Homestay Program are carefully selected and comply with strict guidelines from the Ministry of Tourism in order to bring out the best of Malaysia. 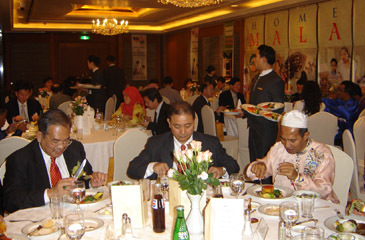 Mr. Mihn Byung-Il (far left), editorial director of The Seoul Times, sits at the head table with Mr. Abdul Manaf Harun (far right), area manager Korea of Malaysia Airlines, and other VIPs. Products and packages include school visit, agro tourism, handycraft, cooking classes, traditional games, martial arts, dance classes, learning English, and many more. Visitors can enjoy the kind hospitality, memorable experience, together with Malaysia Homestay. When staying with a Malaysian family, guests live the life as the local people do, and are treated like part of the family. Most often, this includes staying in a wooden house, dining on local dishes prepared by the hosts, and eating with your hands. In addition, visitors are often involved in local activities that range from cooking classes, a great way to take the local cuisine home through to attending a traditional wedding, watching a local cultural dance, or participating in a Malay martial arts program. All of these are part of the developing Malaysian Homestay Program and key factors that distinguish it from the more simple bed and breakfast type of accommodation. President Haji Sahariman Hamdan of Homestary Association Malaysia speaks at the Malaysia Homestary Seminar. 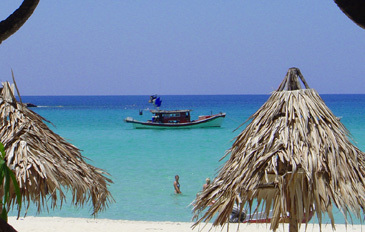 The Homestay Program is designed to achieve several objectives. First and foremost, it is a tourism-based activity directly linked to the community. Local people organize and host the program, and they are the primary recipients of the benefits, financial and otherwise, that accrue from the tourism activity. In addition to the host families, many of the small businesses in the local communities also benefit directly from the influx of tourists. Visitors require services, and local merchants respond appropriately. 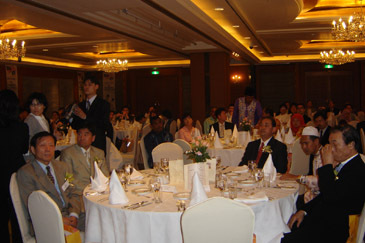 Various types of guests from the different organizations were present at the luncheon seminar, such as the area manager of Malaysian Airlines in Seoul Abdul Manaf Harun, members from other foreign organizations in Korea, members from different multinational companies, and Korean high profiled dignitaries. Director Abdul Mutalib Awang (left) of the Malaysia Tourism Promotion Board (MTPB)sits with Counsellor Shaharuddin Othman of Malaysian Embassy in Seoul at the seminar. 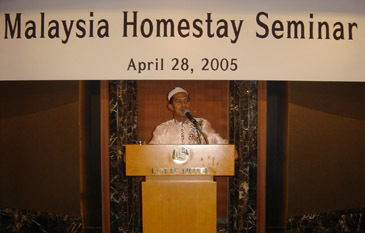 Addressing to the counselor and area manager of Malaysian Airlines and other distinguished guests, as a host speaker Mr. Haji Hamdan said, "In the year 2004, there were about 50,000 people visiting Homestay Malaysia from all over the world. We hope there will be an increase for 2005, especially visitors from Korea.? After the launch, a lucky draw session was held in which winner of the first prize will go to Malaysia as a guest of Malaysian Airlines and Homestay Association Malaysia. Forget beaches and skyscrapers. The Homestay programme in Kampung Renok Baru, Gua Musang offers a holiday with a difference. You get the opportunity to experience the simple day-to-day living of a traditional rural Malay community. Friendly village folk, peaceful and picture-perfect scenery beckon you to take a break, appreciate the beauty of nature and enjoy a slower paced lifestyle in the village. In the Homestay programme, you stay with a foster family for about two or three days and learn about their way of life. All homes under the Homestay programme adhere to the strict rules imposed by the National Homestay Association comprising cleanliness, a private bedroom, water supply, electricity and toilet facilities. Kampung Renok Baru is one of many villages registered under the national Homestay programme since 2001. The village is chosen as it is beautiful and rich in Malay traditions. Most houses there have a brightly painted living room, a spacious kitchen and a lawn adorned with colourful flowers, plants and pond. Each house has a well-kept guest room. It is obvious that cleanliness is the villagers?top priority as each house is so immaculate inside and outside. According to the village headman, Mr. Azri Nulop, the villagers love gardening and most of them have created their own landscaped surroundings. The village won the national-level Cleanliness, Beautification and Village Development Competition organised by the Ministry Of Rural Development in 1999. Homestay guests at Kampung Renok Baru will enjoy the friendly hospitality offered. Some guests have become so close to their foster families that they continue writing letters long after they had returned home. Some of them have even vowed to visit their foster family and friends again. 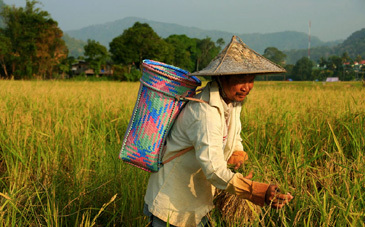 The village population comprises farmers and rubber tappers. The women folk in the village are well-known for their skills in making pressed flowers and bamboo crafts. Guests have the opportunity to try their hands at rubber tapping. However, they have to wake up early before dawn to go to the rubber plantation with their foster parents. Meanwhile, delicious home-cooked traditional Kelantanese food such as nasi tumpang, budu, nasi kerabu and tapai pulut hitam awaits the homestay guests during their stay. Homestay experiences are not confined to the life in the village. Guests also visit other tourist spots in the district. 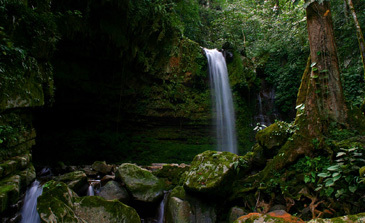 They can go jungle-trekking at a nearby forest, swim and picnic at the picturesque Jeram Pelangi (Pelangi Waterfall) or simply go fishing at the nearby pond during their stay. In the evening, guests can play traditional games like sepak takraw, batu seremban and congkak with their foster family and friends. At night, they can join the village teenagers who practise the dikir barat, a traditional form of entertainment performance that is uniquely Kelantan in origin and character. Guests, especially from Japan, Korea and Europe, prefer to visit the village during the fruit season so that they can explore the orchards and eat the fruits right from the tree. Various kinds of local fruits are abundant during the fruit season, particularly durian, salak (snake fruit), rambutan and langsat. For RM90 a night per person, guests are entitled to accommodation, meals and the opportunity to interact with locals to understand their culture and customs. The room is equipped with fan, wardrobe, single bed and some even have attached bathroom. For homestay bookings, tourists can contact the KESEDAR office at 609-9121 788 or email kesedar@tm.net.my. 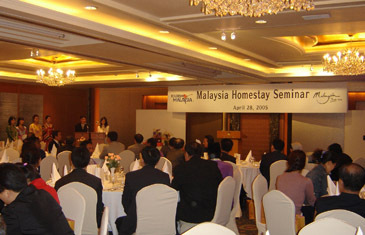 Mr. Mihn Byung-Il (far left), editorial director of The Seoul Times, sits at the head table along with other VIPs during the Malaysia Homestary Seminar at Lotte Hotel April 28, 2005. Counsellor Shaharuddin Othman of Malaysian Embassy in Seoul is making a welcoming speech at Malaysian Homestary Seminar. Director Abdul Mutalib Awang (left) of the Malaysia Tourism Promotion Board (MTPB), Counsellor Shaharuddin Othman (center) of Malaysian Embassy in Seoul, and President Haji Sahariman Hamdan of Homestary Association Malaysia at Malaysian Homestay Seminar held April 28 at Lotte Hotel. 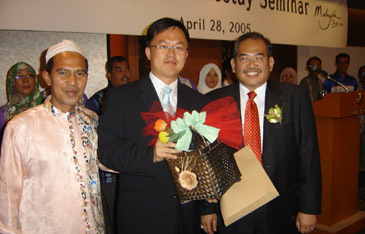 Director Abdul Mutalib Awang (right) of the Malaysia Tourism Promotion Board (MTPB), and President Haji Sahariman Hamdan(left) of Homestary Association Malaysia poses with a participant. "Malaysia Is Ideal for Korean Retirees & Kids"
"You Can Play Golf All Year Round in Malaysia"
ANTOR Chief Stresses "Tourism Exchanges"
Dalilah Ahmad Named As New Deputy Dir. Gen.